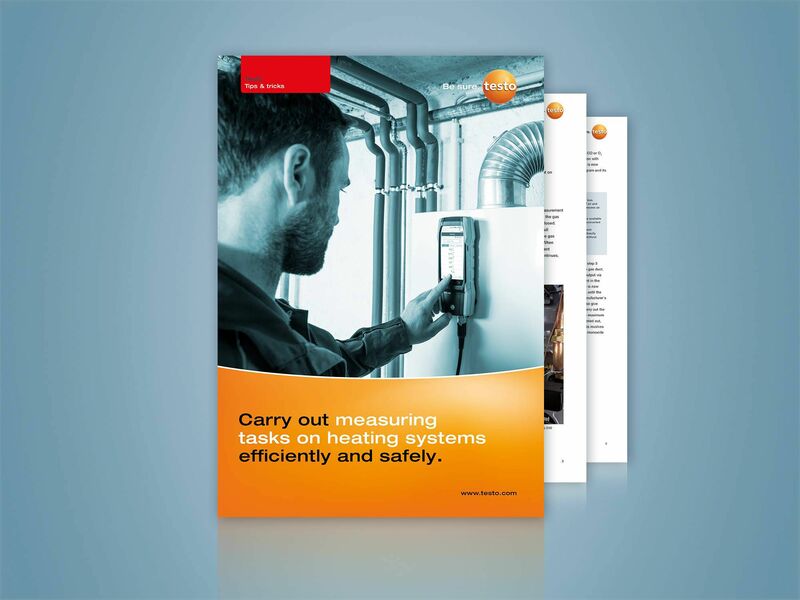 The work steps and tips described here illustrate the essential elements of functional checking and configuration when commissioning atmospheric gas boilers and condensing boilers. Activities to be carried out on forced-draught gas burners are not included. Prior to commissioning, the gas connection pressure must be tested as flow pressure. It must be within the permissible pressure range according to the manufacturer's documentation (in the case of natural gas usually 18 to 25 mbar). If this is not the case, the gas boiler may not be commissioned and the responsible gas supply company must be notified, so that the problem can be remedied. 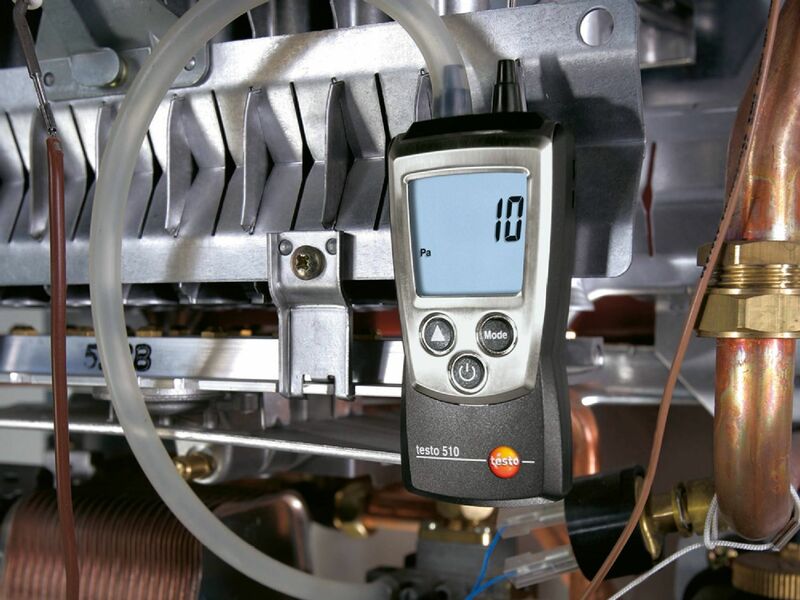 A pressure gauge is connected to the relevant measurement connection of the gas boiler fittings for measuring the gas connection pressure, with the gas shut-off valve closed. When the gas tap is opened, the burner is run to full capacity via the respective operating menu and the gas connection pressure measured as flow pressure. Once the connection pressure is correct, the measurement connection is closed again and commissioning continues. The aim of environmentally-friendly system operation is complete combustion of the fuel and the best possible utilization of the system. The combustion air volume setting is a crucial parameter for optimum operation. In practice, a small amount of excess air has proved to be ideal for system operation. A little more air is supplied for combustion than would be theoretically necessary. The ratio of the excess combustion air to the theoretical air requirement is referred to as the fuel-air ratio λ (lambda). The fuel-air ratio is determined on the basis of the concentration of the flue gas components CO, CO2 and O2. During combustion, any CO2 content has a specific CO (for insufficient air/λ<1) or O2 content (for excess air/λ>1). The CO2 value is not clear in itself as it shows a maximum, therefore a CO or O2 measurement is required in addition. For operation with excess air (normal scenario), determining the O2 is now generally preferred. Each fuel has a specific diagram and its own value for CO2max. In the case of non-condensing appliances, the gas-air ratio is set using the manometric method, i.e. the nozzle pressure is set for minimum and maximum output. To do this, the sealing screw is removed from the measurement connection for the nozzle pressure and a pressure gauge connected to it. The gas boiler is then usually first powered up to maximum (full load) and then down to minimum appliance output (low load) via the operating menu. For both output levels, the nozzle pressure is modified at the relevant adjustment screws on the gas fitting and controlled via the pressure gauge. Information about the required nozzle pressure can be found in the manufacturer's documentation (depending on the Wobbe index of the gas used, which you can ask the gas supplier about): in the case of condensing boilers, the gas-air ratio is usually configured by measuring the carbon dioxide content (CO2) in the flue gas. Prepare the flue gas analyzer as described from step 1.3 onwards and place the flue gas probe in the flue gas duct. Subsequently, get the boiler up to maximum output via the operating menu and measure the CO2 content in the flue gas. To set the gas-air ratio, the gas volume is now modified via the adjustment screw (gas throttle), until the CO2 values in the flue gas correspond to the manufacturer's specifications. In some cases, manufacturers also give setting values for minimum appliance output. Carry out the setting in accordance with the procedure for the maximum output. 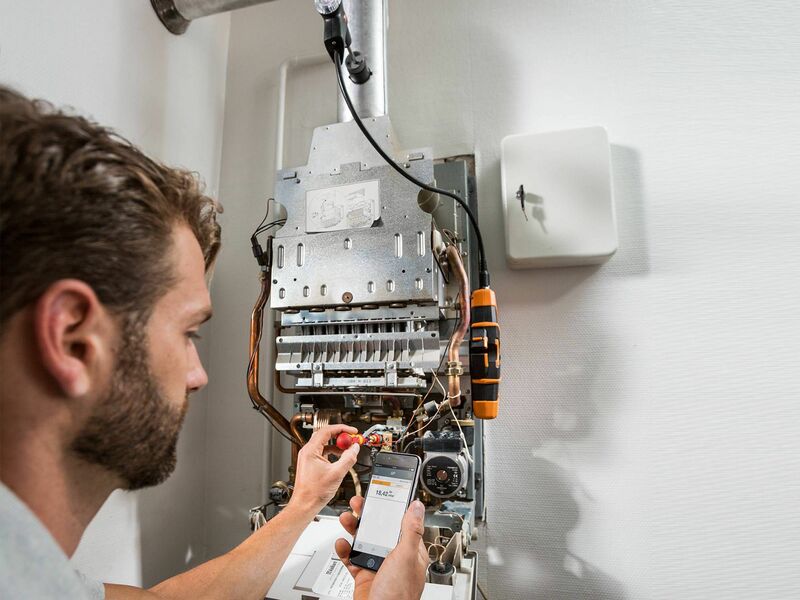 Once these basic settings have been carried out, the configured gas boiler must be inspected. This involves measuring the flue gas loss (qA) and the carbon monoxide content (CO) in the flue gas.